BlenderArt Magazine Issue #20, "Make It, Bake It, Fake It"
Welcome to Issue #20, "Make It, Bake It, Fake It"
This issue we take a look at some great techniques for baking normal maps, lighting and some great effects. Also be sure to check out our gallery of wonderful images submitted by very talented members of our community. Tutorial - Baking normal maps from a high poly model. Picking up my copy... Thanks! Thank you ,its good work. Thank you for your continued development of this great resource. It is truly enjoyed and appreciated. Coolness, normal maps! I want to learn about that. Thank you for all your time and hard work!!! @Bastian: Yeah, I caught that one. It's funny though because the link goes to issue 20, but issue 2 comes up. Must be the server, but we'll get it fixed!! Good work, thank you very much! Great news. Thank you for this new release of this exellent magazine ! Perfect timing! I was just dl'ing something...now I have something to do! Also a great render-time read. 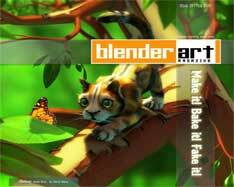 *i find blenderartmag a very serious issue that can be printed on paper and taken everywhere one goes so that they can read it on a bus,in a cafÃ©....;blender planet...a peaceful place!!!! I love what these people have made for us in these magazines, but Sandra really needs a better portrait in there! I cannot understand the tape tutorial, though. Is there part of the text missing, when it talks about a script? I cannot get the tape winding. Ah snap, no there isn't a part of the text missing, there is added text that is from a previous article. I'll let gaurav know that we have an issue with that article. Is there now a magazine out on Blender ??? Where does one get it ???? Cost ??? ?